Steven Atkinson is a Board Certified Physician Assistant specializing in Geriatric Internal Medicine. He practices medicine in the greater Minneapolis area. In addition to his private practice, he has been on the faculty at the University of Utah since 1994 and has been involved in medicine for over 30 years. Steven is the co-founder of Twin Cities Physicians, which serves older adults in nearly all levels of their care. He has presented nationally for over 15 years, primarily speaking about geriatric-related syndromes. 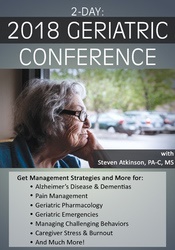 Steven is the author of Geriatric Pharmacology: The Principles of Practice & Clinical Recommendations, Second Edition (PESI, 2016) and also sits on several boards whose purpose is to elevate the level of care in medicine for the patients they serve. Steven has been described as a "dynamic" educator and one of the most engaging presenters around. Don't miss him!